July 14 - In under two weeks' time, London showcases the largest sporting event in the world – and Tom McNab wants to use this opportunity to impress upon people the importance of the Olympic ideals through his play 1936, a powerful examination of the controversial Berlin Games, which is set to hit London theatres. The performance will be followed by a two-hour Olympic activity panel involving London 2012 head Sebastian Coe, British Olympic pole vaulter at Mexico City 1968 and Munich 1972 Mike Bull, British Holocaust survivor and former champion weightlifter Ben Helfgott and McNab, the 1992 British Coach of the Year. 1936: A play about the Berlin Olympics (pictured top), balances the political issues leading up those Games 76 years ago which proved a huge propaganda success for German Führer Adolf Hitler despite the agony felt by the athletes involved. 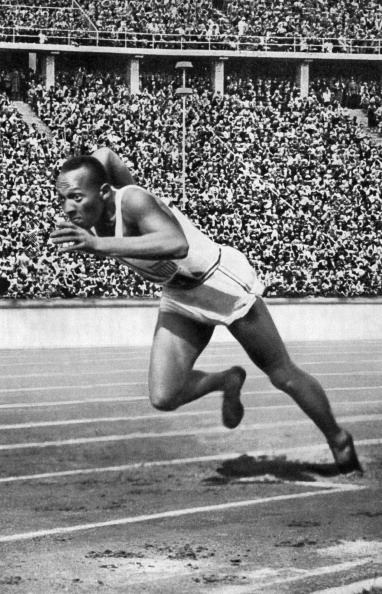 The Games is best known for the remarkable performance of the United States' Jesse Owens (pictured bottom) – an African American and, therefore, under Hitler's Nazi regime inferior to the Aryan German team – who claimed four gold medals, making sporting history. Award-winning author McNab (pictured below, centre) is well known for his role as technical director of the Olympics-inspired film Chariots of Fire, which won four Oscars, and he has now taken his Olympic accomplishments into stage production. "It's a play that is fairly critical of the Olympic Movement as it was in 1936 and there is nothing out there at the moment like this," McNab told insidethegames. "The Olympic Movement and sport didn't step up to the plate with [tackling] the major ethical issue of the persecution of the Jewish athletes. "It's all very well having these ideals about Olympians, but it's how you apply them when you face a challenge – that's what really matters." The German selectors, undeniably the most influential in Olympic history, acted in accordance with the Nazi regime by not allowing any Jewish athletes to represent the home country, excluding some of its best medal hopes including Lilli Henoch, the shot putt and discus thrower who set many world records. McNab, who has coached the British bobsleigh team and England's squad which were runners-up in the 1991 Rugby World Cup, told insidethegames how he has always been fascinated by the infamous footprint left by the Nazis during the 1936 Games. "Ever since I watched the film Olympia [about the 1936 Games], I have always been interested in the time period and that film was a vital part of my inspiration for this play. "This, along with actually meeting Jesse Owens himself in 1964 in Tokyo and my wife, Jenny Lee, who is an actress and director, turned me towards writing plays." 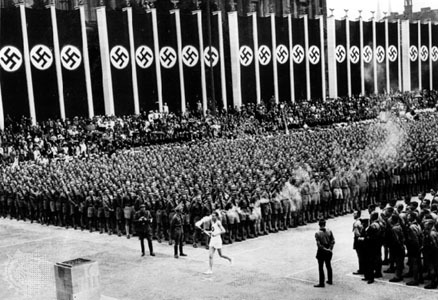 With Berlin winning the race in 1931 to host the 1936 Olympics (pictured above) – the first Games to be televised – the Nazis used the period ahead of the Games to promote its extremist racial propaganda and did not wish black or Jewish people to participate in the event. "Sport is the one thing in the world where the rules are the same for everybody," insisted McNab. "There is nothing in the world like it. "Take religion: Christianity is not quite the same as Islam, Islam is not quite the same as Hinduism. "Sport is the one thing where the rules are the same for everybody and the ethics has to be contained by everyone." Racist discrimination was deemed a violation of Olympic values, so by participating in the Games the 49 competing nations – a then record turnout – were seen to be supporting the Nazi dictatorship; however, the boycott proposal was overturned in the belief that the Olympics should not reflect political values and was merely a contest of the world's greatest athletes. Had this boycott gone ahead we would now have been reading from a very different history book altogether. As a former Olympic coach of the Barcelona 1992 British basketball team, McNab is thrilled to see this year's Olympics on his home turf. "The Olympics in London is going to be terrific, and it's great to show that the British can do this and organise things better than anyone else in the world." He added pointedly: "If the Government could govern the country as well as we have organised the Olympic Games then we would be freed of a great deal of our bothers." 1936: A play about the Berlin Olympics will be opening its curtains at Lilian Baylis Studios at Sadler's Wells Theatre on July 18, just nine days before the London 2012 Olympics Opening Ceremony. Book your London Theatre tickets via insidethegames here.